It was tested and is working properly. My view is good preowned condition. Barnes and Noble Nook Color. Barnes and Noble Nook color. We are based in an electronics recycling warehouse located in Northern Colorado. No exceptions. It is in working condition. The right side of display is a little bit yellow. Barnes & Noble Nook Color 8GB 7" eReader Tablet BNRV200A. Notes : This is a used Nook Color that has been tested, cleared and reset to factory defaults. No accessories are included. Model : BNRV200A. Barnes & Noble Nook Color Wi-Fi 7" 8GB Black BNRV200. Condition is Used. Used in very good condition. Some smudges on the screen, the back of the unit has some small scratches on the rubber backing. Refer to the pictures for exact condition. Great for reading books on the go. Buy it now or Best Offer!! Happy Bidding!! Buy it now will include USB cable for charging, not pictured. Model Number BNRV200. 8 text sizes, 6 font styles, change background colors, line and margin spacing. Full lamination process reduces glare and optimizes brightness -- read indoors or outside. Type eBook Reader. This Nook is fully functional and in excellent working condition. There is minimal wear on the body from normal use, as shown in pictures. It does not affect the functional integrity of the Nook whatsoever. It's running Cyanogen Mod 7. You may need to wipe and update it. Model: BNRV200. Book Color Tablet eReader. Barnes & Noble. Tested and working. We promise to resolve your concerns quickly and professionally. Proceeds are used to support local programs and services. Barnes & Noble Nook Color eReader BNRV200 Tablet. A-111-A 2004620032202003 SC. Certain phones will require a sim card or an existing smartphone data plan. Box and Manual. AT&T Cell Phones. Graphing Calculators. In good shape, works great. Has a Cyanogen root on it. Check out the photos. This is a pre-owned Barnes & Noble Nook Color 8GB wifi tablet. The inside of the case is worn but functional. The Nook Color itself has a crack at the top left above the screen & a small piece of plastic missing from the lower left side but the tablet works as per the pictures. Barnes & Noble NOOK Color eReader Tablet - 8GB, Wi-Fi, 7in - Black - WORKS! Barnes & Noble Nook Color eReader Tablet w/ power adaptor Great Condition! Used Nook Color BNRV200. Includes Original Nook Wall Power Adapter. This is my Nook that I have used for years. Barnes & Noble Nook Color 8GB - this tablet has been reset and is in working order. These include, but are not limited to swords, daggers, ninja stars, bb guns, airsoft rifles, etc. Contents however will not be affected. 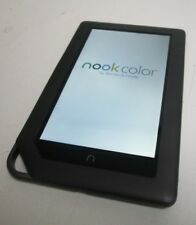 UP FOR SALE IS Barnes & Noble BNRV 200 Nook Color Touchscreen E-Reader 8GB Wi-Fi. Barnes & Nobel BNRV200 NOOK Tablet works 100% ~ Free Shipping. No extras unit only. Real pictures. 4.5 out of 5 stars - Barnes & Nobel BNRV200 NOOK Tablet works 100% ~ Free Shipping. 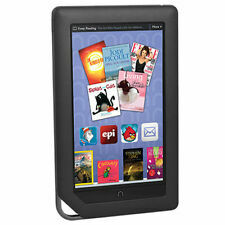 842 product ratings842 product ratings - Barnes & Nobel BNRV200 NOOK Tablet works 100% ~ Free Shipping. Barnes & Noble Nook Color 6GB Tablet eBook Reader BNRV200 . Condition is Used. Shipped with USPS Priority Mail. These Nooks are fully functional and in excellent working condition. There is minimal wear on the body from normal use, as shown in pictures. It does not affect the functional integrity of the tablets whatsoever. 4.90GB HDD. See Photos for Details. Black nook case included. Unit is clean. All buttons work. We will help to resolve any issues quickly and fairly. Alaska and. Unit is fully functional. Unit is not missing parts (power adapter). BNRV200 - Barnes & Noble NOOK Color 8GB, Wi-Fi, 7in - Black. MINT CONDITION. Barnes & Noble Nook Color 8GB, Wi-Fi, 7 inch - Slate. Condition is New. Shipped with USPS Priority Mail. Nook Color Device. 4 GB Micro SD card for more storage. Great for travelers. Note: Set back to factory settings. Very clean and in great condition. See photos for more detail. Original charging cord and wall mount. GREAT CONDITION! Includes: Nook, Case, Charging Cord. NOOK COLOR in EXCELLENT Used Condition It was used but never abused Always kept in protective quality case Always protected with screen protector Thoroughly Cleaned and Polished Will be unregistered and reset to factory settings before being shipped. INCLUDES: New Case and screen protectors Charger Original Box w/ Interior Packaging Be sure to check out the store for other great items and bargains. And remember we combine shipping on multiple purchases. In GREAT condition, comes with a case as well. Looks brand new, no scuffs or marks. BNRV200A 8GB NOOK eReader. Barnes & Noble BNRV200. Also includes original box. Barnes & Noble Nook Color 8GB, Wi-Fi, 7 inch - Slate. Condition is Used. Shipped with USPS Priority Mail. Used tablet that has been cleaned and factory reset. Does not include any accessories! Barnes & Noble Nook Color Wi-Fi 7" 8GB Black Tablet Only USB is Not Included. BNRV200 Nook Color was tested and worked great. BNRV200 Tablet is used, overall in good condition. Tablet has been Reset back to factory. Model #: BNRV200 - 7". Barnes & Noble Nook Tablet. What is included?. : Nook tablet only. Screen has several pressure marks. Have an issue with your item?. Don’t worry, we’ll resolve it! Barnes & Noble Nook Color TouchScreen Tablet eReader. 8GB Wi-Fi Black. With Folding Protective Cover & Charging Cable.